In our upcoming title, The Novelist, you can follow copywriter and poet, Laura, as she tries to figure out how the hell to write a novel to meet Megan Willow’s challenge: a book by September. Megan has a thriving tea business and does everything in a big way. To her, the idea of writing a novel in a matter of months is beyond simple. All you need is the will, and you’ll find the way. Laura delves into her own past, as she tries to bring a novel into the present. To tutor her efforts, she culls wisdom and hope from greats such as Mario Vargas Llosa, Mary Shelley, and medieval story-weaver Murasaki (whose real name has been lost to history, because she was a woman). Can Laura write a novel by September? She might not even make a cup of tea by midnight. So who’s to say. The Novelist, a novella by L.L. 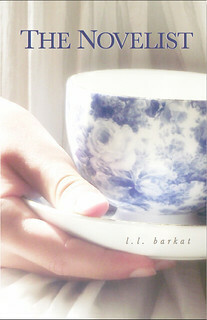 Barkat, T.S. Poetry Press, coming in September 2012. Cover image by Sarah Elwell. Thanks to James Cummins, the poet who agreed to lend his name and his friendship for this book. The Novelist: What’s the Big Idea in Fiction? Should we wager that Glynn will be the first to have a review? What do I get if I beat Glynn to a review? Thanks, Maureen. I have to smile that it’s a novella that ended up being written… well, by September. Now to see if our character can do the same. This makes me smile a hundred smiles, and it sounds remarkably like a real life Laura and Megan I know. Hmmmm . . .
LL – You amaze me on so many levels. Can’t wait to read! she was gracious, btw, to let me include her. Ish. In the book, she does tea in the biggest of ways. Big like the soul I picture in our own MW. I think you should tackle translation next . . . of the most romantic poet. Monica, I knew I could start something. It’s a plot related to sales of, you know. . . .
Ah, Kimberlee. 🙂 A novella, if it makes you feel any better. I’m looking forward to this Laura. I’m in the middle of trying to write a novel myself. I can hardly believe I even have the nerve to say it let alone do it!